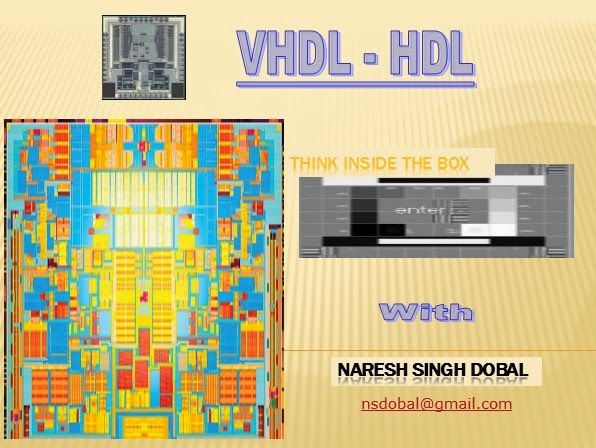 Think Inside the box (VHDL Design) with me "Naresh Singh Dobal"
Think Inside The Box (VHDL Design) "Learn vhdl with Naresh Singh Dobal Series". Hello friends, After considering few of my last blogs I believe you got the basic idea about our EDA & Semiconductor Industry, and now you know that how the computer chips are manufactured and how they are designed, so now you are aware about the process that how this EDA industry is important for VLSI Industry. Today I am going to tell you that how a designer / engineer works with this EDA industry. I am going to start this with the basics of HDL & most widely used HDL in defense and other complex electronics design i.e VHDL (Very High Speed Integrated Circuit Hardware Description Language). So lets start with this educational series named, “Think Inside The Box” with me “Naresh Singh Dobal”. VHDL - A small Description (Learn VHDL with Naresh Singh Dobal Series). VHDL Stands for VHSIC Hardware Description Language, here VHSIC have it’s acronym i.e. Very High Speed Integrated Circuit. 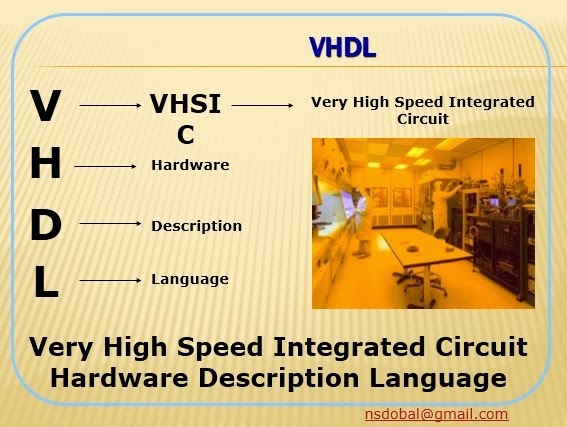 So VHDL is “ Very High Speed Integrated Circuit Hardware Description Language “. Here Hardware Description represents the whole description of electronics circuits in the term of flow of data, schematic design or interconnection of components and in the terms of functions or truth table. Integrated Circuits represents Digital IC. Language means a set of standards, codes and commands. I would love to read your comments, ideas, questions, suggestions anything, So kindly feel free to contact us at nsdobal@gmail.com or write within the comment bar below to make this series interactive and more informative.